Most fruit varieties are stored under high relative humidity, above 95%. Moisture loss can limit the storage quality of fruit in a cool cell. An important aspect of moisture-loss for pears, for example, is the occurrence of ‘saggy necks’, when the skin of the pear near the stalk begins to wrinkle. In order to avoid saggy necks, pears must not lose over 2.5% moisture. Fruit that is stored in a CA-/ULO cell loses moisture. This moisture loss reduces if the RH levels (relative humidity) are kept above 90-95%. During cooling in a cell, water is taken out of the air and, as a result, the RH level falls. The water removed then freezes on the coolers (humidifiers) and is drained away when defrosting. 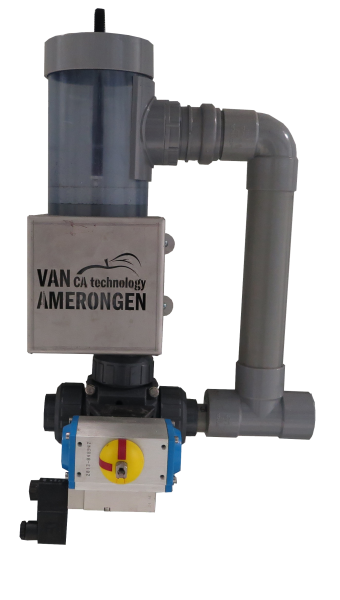 Van Amerongen supplies water meters that automatically limit this moisture loss. The controller of a Van Amerongen installation can be fitted with a software module that registers the number of lost litres. You can thus maintain an overview of moisture loss within a storage cell. Ultrasound humidification is an excellent solution for temperatures around and just under zero. This method uses high-frequency sound waves to move small vibration plates which then spray out small droplets. These droplets have a diameter of 0.5-1.0 µm and are so small that they do not fall and freeze but immediately evaporate in the cell air. If water quality before humidification is insufficiently high, a pre-purification installation may be required. The objective of ‘Reverse Osmosis’ is to cleanse the water and descale it so that the vibration plates are not affected by limescale.